Only 157 librarian positions are budgeted for this school year, to serve a total of 652 elementary and high schools. That number is down from 217 last year, and 454 in 2012. The South and West Sides are being hit particularly hard: according to the Chicago Teacher’s Union (CTU), in 2015 only two high schools with a ninety percent or higher African-American student population had a school librarian, down from nineteen in 2012. There are several factors at play in the decrease in librarians. CPS’s already-cramped budget has been cut by $104 million since this time last year. That comes out to a seven percent decrease in the money given for each student. Since 2013, funds have been allocated to schools based on enrollment, putting pressure on any school that loses students. In addition, principals are often forced to cut programs to make up for the lost funding, while making sure their school maintains a positive image to avoid any further drops in enrollment. This can lead to subtle changes in hiring and staffing decisions that hide the cuts that have been made. Marie Szyman, a longtime school librarian at Nathanael Greene Elementary in McKinley Park, explained that this is part of why it can be so difficult to find out which schools actually have librarians. The only national attention this trend has received is from a protest staged by students at Bronzeville’s DuSable High School last December, in response to the news that their school librarian, Sara Sayigh, was going to be laid off at the end of that month. The students organized a “read-in,” in which they walked out of classes, checked books out of the school library, and read in the hallways for hours. In response, an anonymous alumni donation helped to fund Sayigh’s position through the end of last school year, and is now completely funding a part-time position for her after CPS removed her position again in the latest round of cuts. Regarding the overall cuts that have plagued school libraries and programming for many years, Sayigh recalled how cuts affected the citywide high school book club that had flourished through the early 2000s, and which was previously supported by the district. Annual conferences were held with authors, students, and teachers. “Just sitting in the auditorium with so many high school readers affirmed the value of what we were doing with our students, and affirmed the value of reading to all those students,” she said. 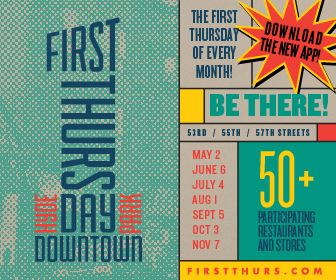 The district, however, cancelled the program after Mayor Rahm Emanuel took office. Only a few schools were able to continue their chapters by scraping together grants and donations. A related problem is the trend of moving librarians out of the library and into a classroom in an attempt to mitigate increasing class sizes without hiring additional staff. Illinois, like most states, requires school librarians to also be certified teachers. CTU reported that in 2013 fifty-eight librarians were shifted into full-time teaching positions. Marge Fashing, a retired CPS librarian, added that rumors about layoffs were used to scare many librarians into taking classroom positions. One librarian we spoke with was offered a supplemental teaching position. Her principal originally told her that she could continue to serve as the librarian as well, but none of the plans she proposed for keeping her library active were accepted by the principal. Again and again, librarians have emphasized that classroom libraries are no replacement for a fully staffed school library. The prescribed reading levels implemented in classroom libraries are particularly worrying: Charles Gunn, President of the Chicago Teacher-Librarian Association (CTLA), explained that principals don’t always understand how having a set of ten books for each level isn’t enough, and can close students off from exploring books. Numerous studies back this up, emphasizing the importance of the presence of a school librarian and the amount of programming the librarian can offer. Researchers have focused in on things like the priority given to librarian–teacher collaboration, the hours the library is open, and what technical skills are taught in the library. A 2003 study in Illinois found that providing more flexible library hours increased reading scores by ten percent and writing scores by eleven percent on the ISAT. Moreover, programs such as reading workshops were more effective at increasing student performance when led by a librarian instead of a classroom teacher. Gunn speaks of his experiences using teaching technology, with schools buying Chromebooks to help students use Seeking Online Access to Resources (SOAR), CPS’s research portal. Since CPS has Google accounts for everyone, “it’s really just a natural fit. But it’s just a question of if teachers are going to be able to do all that, and really be up to speed and focused. So that’s where in the library we can be a partner.” The same is true for e-books, which can serve to increase students’ access to reading material, but as a resource alone can’t serve as a substitute for individualized book recommendations from a librarian based on their knowledge in finding just the right book for a child. Disparities in which CPS schools have librarians are all the more alarming in light of these findings. CTU reported that in 2015, seventy-five percent of majority-African-American schools didn’t have a librarian, compared to sixteen percent of schools with a less than fifty percent African-American population. CPS’s own demographic analyses, conducted each year to determine quotas for selective enrollment schools, and defined using census data on socioeconomic status and other factors affecting student achievement, can be used to highlight the systemic disadvantages in library access. 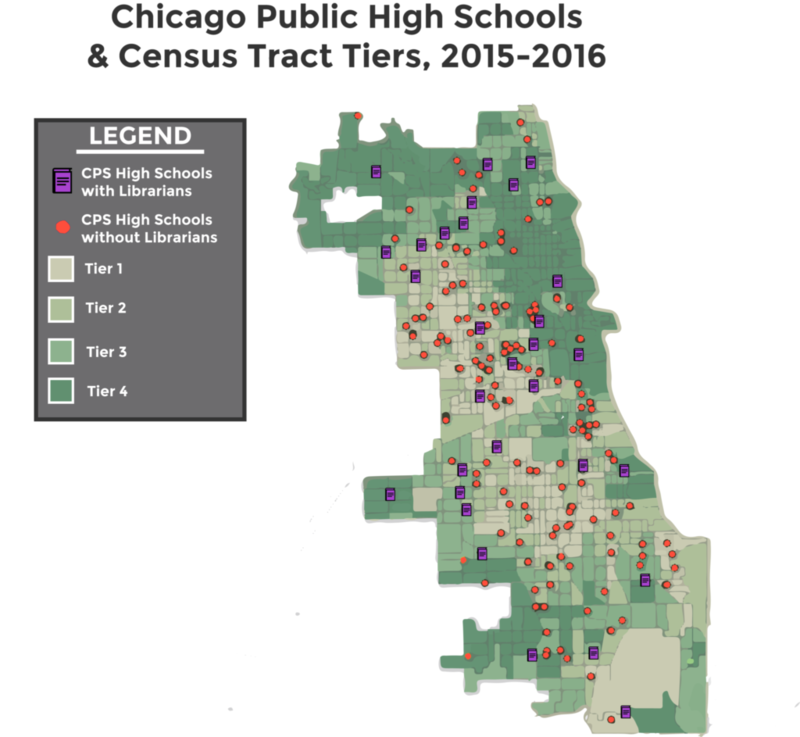 Overlaying a map of Tier 1 areas—those that are ranked lowest by CPS in terms of income, average education level, and other factors—and a map of which districts lack librarians, shows that schools in Tier 1 areas are far more likely to lack librarians. This is a problem Sayigh has seen time and time again. Map legend: The color grading begins at the lightest — Tier 1 — and gets darker with each Tier. Clicking on a census tract shows demographic information about the area. Green dots represent CPS high schools with librarians, red dots are those without. Click on a dot to learn more about the school. Special thanks to Open City Apps for their open source Tier visualization and data. Where is the data being pulled from? As Principal of Lindblom Math & Science Academy, we have a vibrant library with both a Librarian and Librarian Assistant staffed. Our library opens at 7 am and closes at 5:30 pm daily to ensure Lindblom students have access to a safe academic space that provides them with technology and research at their finger tips. Our library has a constant hum of engaged learners and an active Writing Center. The Writing Centers is a place where students can receive additional support and feedback on their writing assignments, scholarship applications and college application essays. Thank you for such a thorough overview of the problem, and explaining why we should care! ALL students deserve a certified librarian! So sad. While reading and student achievement in reading is impacted by reading, I think it is also important to note the need for teacher librarians in schools to help teach information literacy. Especially in light of the new “ah-ha” circulating around the internet about many “fake news sites” that propagate social media sites–so many people, students and adults, don’t realize that fake sites look and sound a lot like the real sites. Source evaluation and ethical use are critical. Teacher librarians do that important work too!